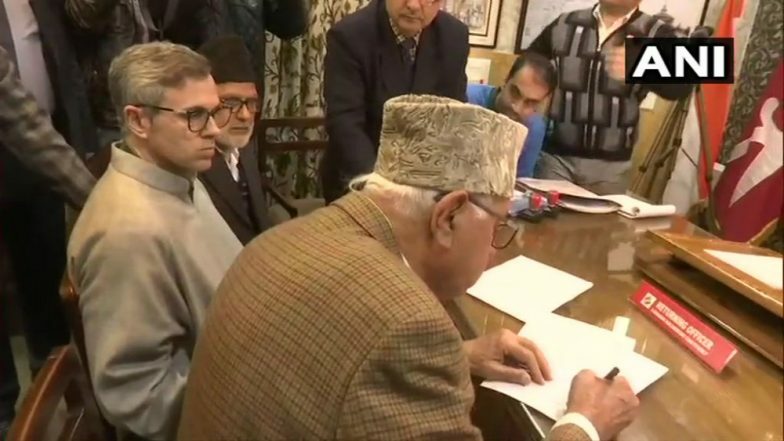 Srinagar, March 25: National Conference (NC) president Farooq Abdullah Monday filed nomination papers from the prestigious Srinagar Lok Sabha seat which is going to polls in the second phase of the general election on April 18. There was no pomp and show as only few vehicles of the NC leaders were allowed inside the deputy commissioner's office complex in Tankipora area here. Lok Sabha Elections Results 2019 Prediction by Satta Bazar: BJP to Win Over 250 Seats, Congress 74, Says Matka. The police has barricaded the entire area as part of security arrangements to prevent any untoward incident and did not allow any supporters at the venue. The returning officer had earlier issued guidelines, saying the maximum number of people allowed at the time of filing of nomination by a candidate would be five, including the candidate, whereas the maximum number of vehicles allowed would be three.